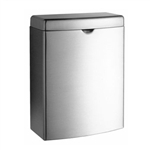 Commercial-Specialties.com offers a wide variety of napkin disposal like stainless steel napkin disposals, surface mounted sanitary napkin disposal and vendors. 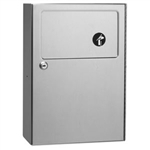 One of our noteworthy products is our recessed sanitary napkin disposal which features a 1.5 gallon capacity with a push flap door. 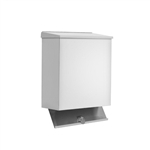 This disposal is made from satin finished stainless steel and at an affordable price is a great option for commercial washroom solutions. Check out our full selection of sanitary napkin disposals and other washroom accessories today!